Prep. Remove the kale leaves from the stem. Chop into bite size pieces and soak in a bowl of cold water for 5 minutes. Strain and dry completely. Roast. Preheat oven to 425°F. Cut the florets of the broccoli into smaller bite sized pieces. Toss with 2 teaspoons of canola oil and salt. Spread onto half of a sheet pan so there is plenty of room between pieces. Cut the bagel into small cubes and toss with 1 1/2 tablespoons of white truffle oil and salt. Spread onto the remaining half of the sheet pan. Roast the broccoli and croutons for 10 to 15 minutes, until broccoli is well roasted and slightly charred on the ‘leaves’ and croutons are golden brown (see note.) After the croutons are golden brown, drizzle with the remaining 1 1/2 tablespoons truffle oil. Toast. Heat a cast iron pan over medium high heat. Cut the kernels of corn off the cob. Drizzle the remaining 1 teaspoon of canola oil over the pan. Add the corn and stir to coat with the oil. Cook for 5 to 7 minutes, stirring occasionally, until the corn is bright yellow and slightly charred. Assemble. 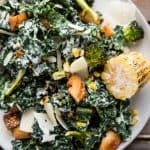 In a large bowl toss the kale with the caesar dressing. If serving in a different bowl or platter, transfer the dressed leaves first before topping with the croutons, broccoli, corn and shaved parmigiano cheese. If preparing ahead, wait until serving to add the croutons. The croutons may be done before the broccoli. You can either cook the broccoli and croutons on separate sheet pans or have a bowl nearby to scoop the croutons into before returning the broccoli to the oven. You sholud be able to find white truffle oil in the oil and vinegars isle at the grocery store. It will most likely be ‘truffle flavor’ which will work just fine.